Linking with Melanie again at The Wine-Dark Sea. I honestly don't remember what I did with the children yesterday because it has all been blotted out in my mind by an argument I had with a stranger on the Internet for most of the day. I don't recommend those and usually don't get sucked in. My bad. Right after we got home from church, my brother called to tell us that Jack Hanna's Into the Wild was about cheetahs and we needed to turn it on and watch. We complied and brunch was delayed while we distractedly got food together and watched the TV. They had a king cheetah, which has stripes instead of spots, and Dave speculated that it was probably more like a breed of cheetah instead of a sub-species. He and Grace discussed the difference between breeds and species and Grace was skeptical until the cheetah expert on the TV said that they used to think that king cheetahs were a separate species until they studied them and determined it was a recessive gene trait. So there. Olivia worked on handwriting a little and said her teacher said she wasn't allowed to work on cursive at home. I told her the teacher doesn't get to tell us what we are allowed to do at home. I arrived home to find Sam and Olivia with an elaborate pillow fort happening in the living room while Grace was upstairs buried in a book. 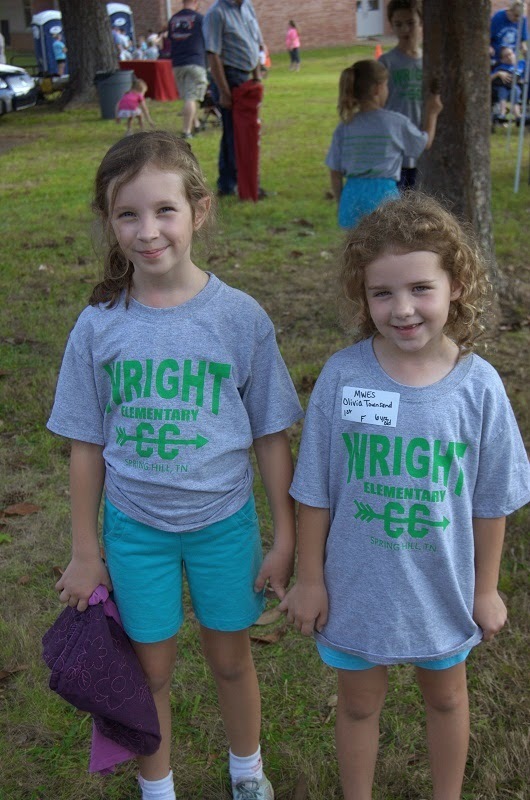 Both Grace and Olivia had library at school. Grace checked out "Double Fudge" and Olivia checked out a book on swans. At supper Grace said that she was going to have to do a PowerPoint project on a European explorer with a partner. The explorer is to be drawn at random out of a hat and the partner is to be drawn at random out of a hat. Everything about this project makes me want to hide: PowerPoint and group projects. Grace is pretty anxious about it. She has a whole list of people she doesn't want to work with because they don't do good work. And she is also self-conscious about her lack of ability in PowerPoint because her stupid parents don't think PowerPoint is very important in the elementary curriculum and don't let her practice. Dave: You could get Marco Polo. Grace: Did he invent the game? After supper, Marian was tired of being confined so I repaired upstairs with her so she could run free in the only minimally baby proof area of the house while Dave stayed down to wash dishes. What happened next I can only describe as the closest thing to feeling like a homeschooler without actually being a homeschooler. Olivia announced she had homework that was due tomorrow. This was true enough. Actually we had completely ignored Olivia's monthly homework for the past three weeks and had mountains to make up. Since her homework requires an adult to sit with her and read through the instructions out loud, she came upstairs so I could help her. Grace wanted to work on her cheetah blog and Sam wanted me to read to him out of the nursery rhyme book while Marian ran all over. I would read Olivia an instruction on my left, turn to Sam on my right and read him a verse, randomly spell out words for Grace as she called them out, and tend to Marian as she crawled all over us, wanting to nurse, wanting down, wanting Sam's book, wanting Olivia's pencil. We kept this rhythm up for probably 45 minutes. Olivia and I powered through FIFTEEN pages of math homework! No page had more than six problems and a lot of the problems were just counting problems, but still, it was a lot of work for a six year old. I was mulitasking to the extreme and never got frustrated. Olivia got tired towards the end, but she, too, never got frustrated. The whole evening was glorious! I felt like a real mother doing real mother things. Signed two agendas and Olivia's homework pack, read one newsletter, and learned that Wednesday is another Burger King night. 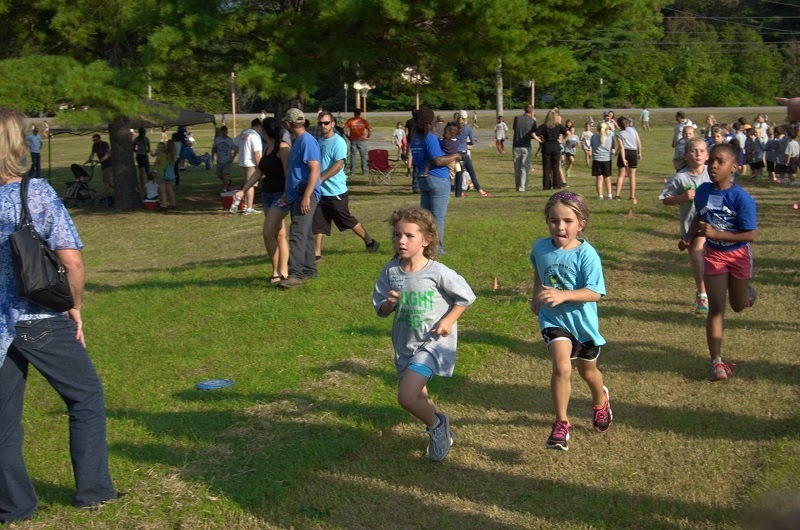 The girls had cross country practice after school. They both had art class too. Olivia painted her sunflower from last time and Grace made a value chart. I had no idea what that might be so she explained it to us. Sounds like a color chart where you start with black and then the next spot is a little lighter and the next a little lighter until you get to gray and so on with all the colors. She was amazed to hear I have never taken an art class in school. 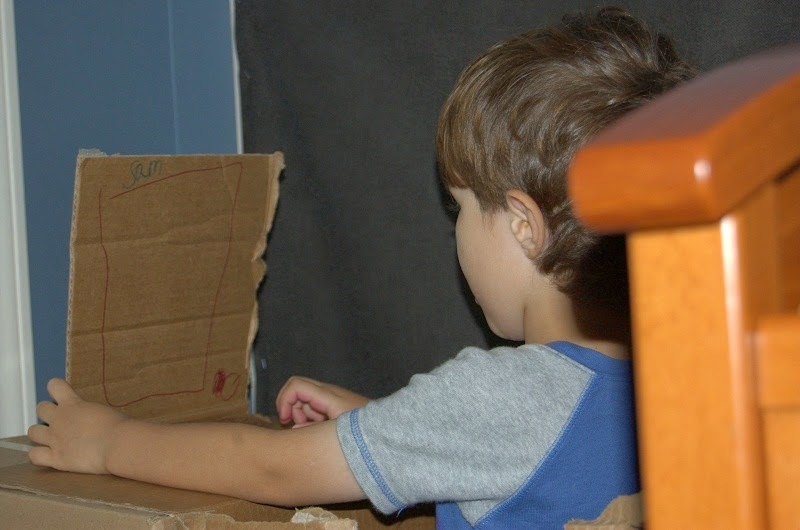 After supper, Sam and Olivia created an elaborate workshop out of a couple of big, cardboard boxes we had gotten that day. 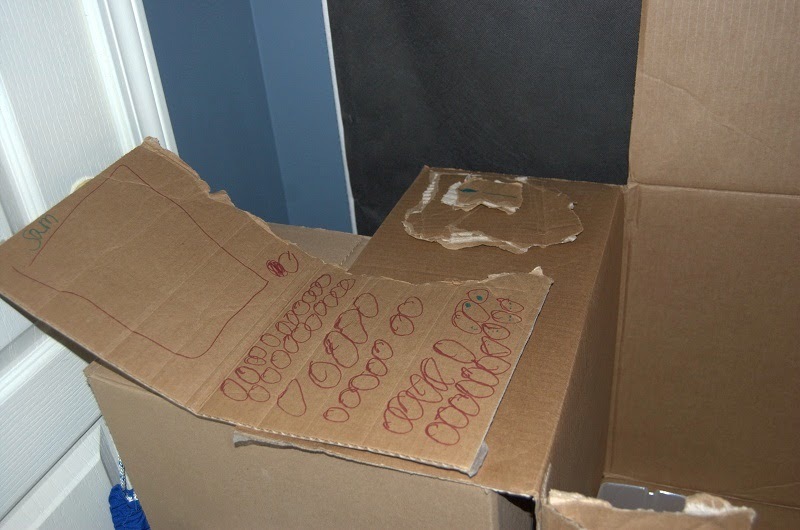 They had a room with windows and doors, a computer with a mouse, and a TV with remote. They set about to do their work and played this game most of the night. Grace was in and out of the game, doing whatever she was doing. Laptop. Note the mouse with the mouse pad. Signed two agendas and ignored a stack of letters that came home for me to read. 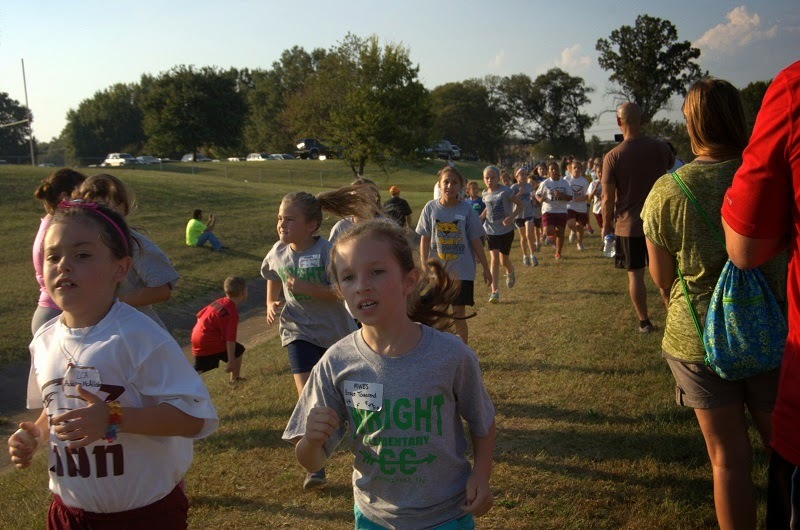 The girls had their final cross country race of the season. They both did well again. Both finished in the middle of the pack again. I hope we get their times soon. I wish that list was a joke, but no. So I guess we did take the opportunity to discuss our views on tobacco use and how it is possible to not smoke even though people around you are smoking, but we are definitely not doing it every day for a week. Part of what annoys me about this is that they are taking away from instruction time or, worse, recess, for futile attempts at influencing future habits. Of course there are exceptions, but I am willing to bet that the vast majority of future smokers live in a house with a current smoker and all the assemblies in the world is not going to change the impact of the lived experience of a child. So I don't know. I understand why the schools feel the impulse to do these things, but it seems like a giant waste of time to me. After the race was Burger King night! Hopefully there will only be one more of these coming up for awhile. After we got home, girls needed bathed and then the bustle of getting ready for bed, and then Grace announced she had homework. Tears as we said she just needed to go to bed. Signed two agendas, got Olivia's school pictures, and saw some other piece of paperwork that I cannot call to mind right now. I had to leave a little earlier than normal (well it actually should be my normal leaving time, but that's neither here nor there) so I didn't go up to tell the girls good morning before I left. As I drove away, I saw a light on in the girls' room so I am presuming Grace woke up early to do her homework. I don't remember much because I don't remember. Olivia had technology class and Grace had PE. When Olivia went to technology, Grace was in the computer lab working on typing out a story about cheetahs for her writing class. Grace is working on her blog again. 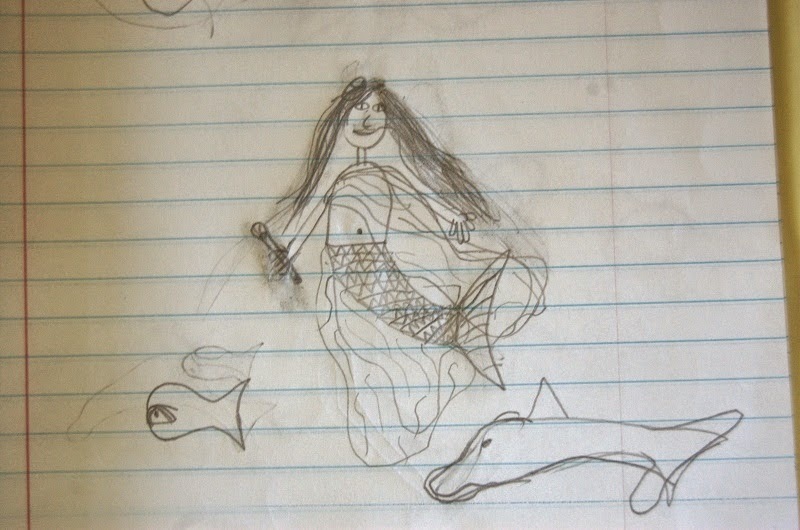 In Grace's folder I found multiple drawings of a mermaid queen. The funniest thing of the evening was when Olivia was "reading" Sam a book. She was full of commentary and inflection. It was hilarious, but as soon as she realized I had turned my attention to listening to her, she stopped. That's a bummer. Olivia has a very wry sense of humor but hates being the center of attention. I feel like I should spend more time with Olivia's reading, but it keeps not happening. Signed 1 agenda since Dave had already signed one, got Grace's school pictures, and read several letters pertaining to the school fundraising festival which will happen the week they get back from Fall Break. Not much conversation at supper. Grace had library where she checked out Andrew Clements "No Talking" which she had mostly finished by the end of the day. Olivia had PE. There was another school wide assembly for the official end of the magazine fundraiser. Oh will these fundraisers ever end? After supper, I read Sam a couple of books, "Smokey the Fireman" again and "Mud Pie for Mother." Olivia took over and they looked through a "Tiger" book. 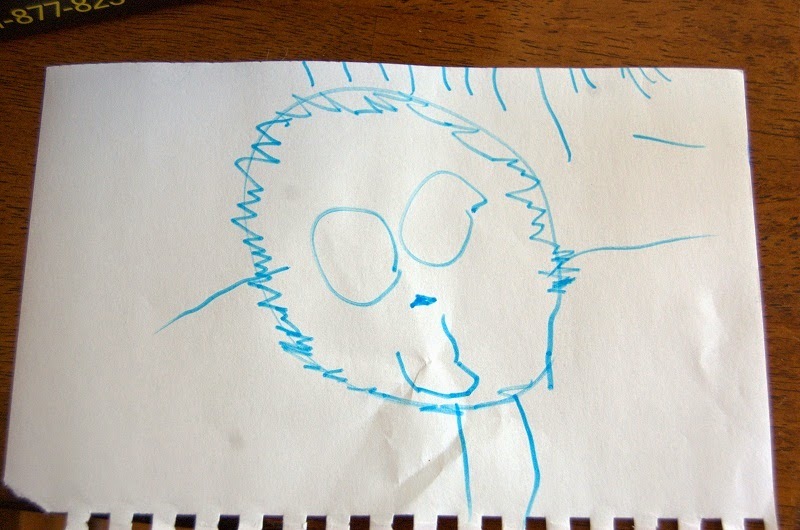 Sam has really become interested in books and drawing recently. 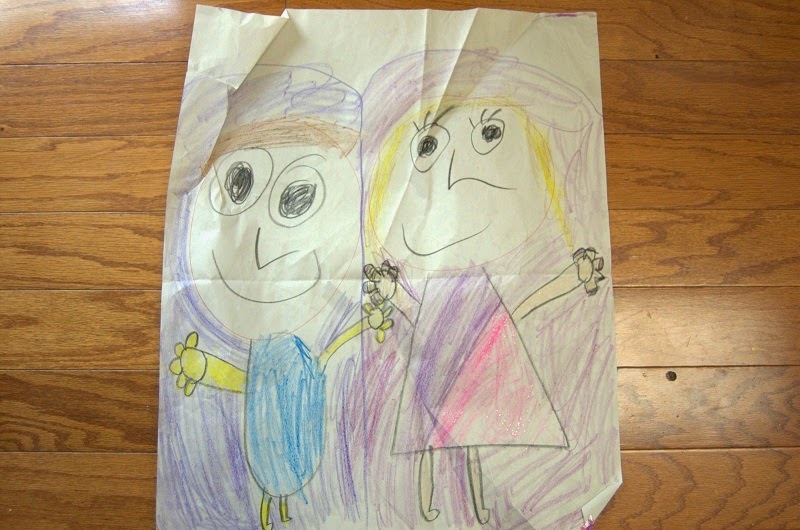 Sometime this week, he drew portraits of Marian and Olivia. Before bed Grace and I were talking about her book which was inspired by a silent protest of Gandhi's and applies the concept to an elementary school which, of course, pits the boys against the girls. It sounds like a strange book to me. Gandhi was protesting societal injustice and the principal in the book just wants the kids to shut up and proposes a no talking challenge, but problems arise when the students take it seriously and then won't respond to their teachers. So, um, what is the point of this book? I don't know, but it gives Grace something to think about. She found out that her European explorer is Henry Hudson and I had tell her that, in fact, the Dutch are not French. We also talked about 4 digit by 4 digit multiplication and how you have to add one more zero to each addition line for every digit and why that is true. I again emphasized the need to keep your columns straight and neat which I think she is starting to understand why I have stressed it. Her handwriting is messy so there is lots of room for improvement here. Dave and Grace made pancakes this morning and Dave made her double the ingredients so some early morning math happening. Overheard quote by Dave while Grace was mixing ingredients that made me laugh: "The more you knock out of the bowl, the less that will be in the bowl." Yes. that's true. Lots of screaming and whining here this morning for reasons I can't quite figure so they were all banished outside as soon as it was plausible. Even Marian was cranky, but she's currently passed out in the playpen. The girls are on Fall Break next week so I'm not sure what will be going on around here. Grateful to not have to sign anything for a week. "her teacher said she wasn't allowed to work on cursive at home." That makes me boiling mad. I'd be calling up the teacher and giving her a piece of my mind. This is why I'm a homeschooler. I'm not capable of moderation when it comes to such things. But I like your response: "the teacher doesn't get to tell us what we are allowed to do at home." And the homework for a six year old rather gets me too. Seriously? She's six! 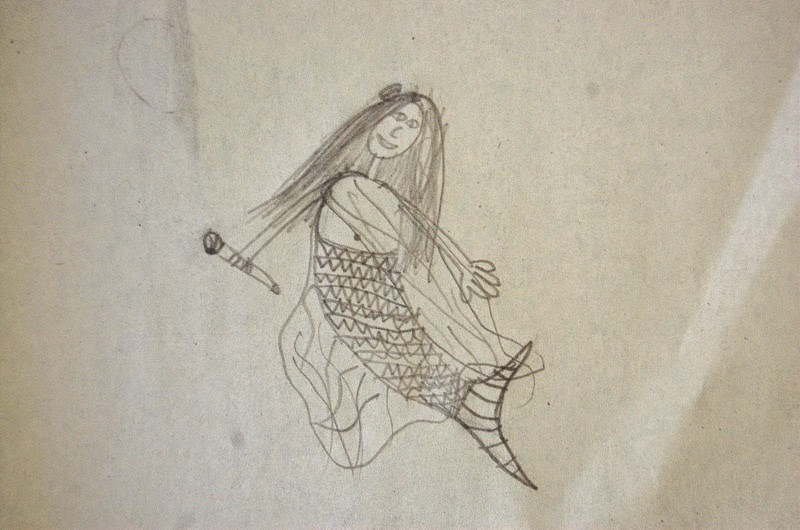 I loe Grace's mermaid. So does Bella. 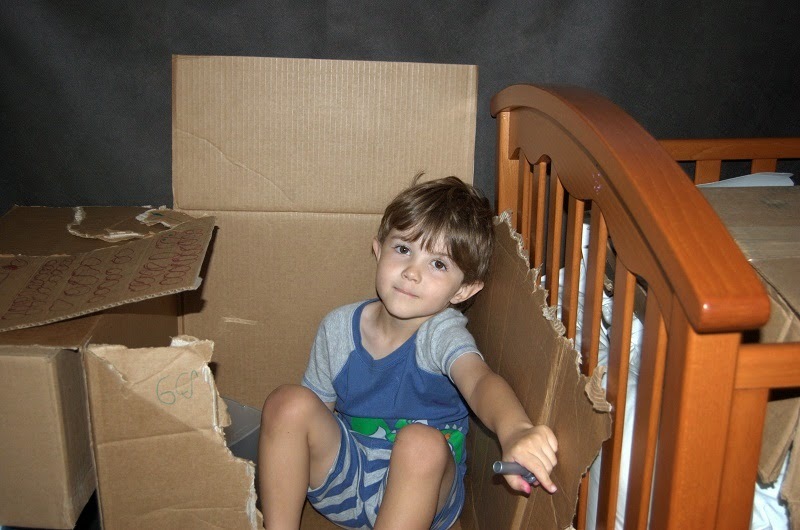 Loved your description of feeling like a homeschooler. "Glorious." I clearly need to get some perspective. I don't get too upset about what the girls say their teachers say because chances are it got mangled in the translation. If I were to guess, the teacher probably said they don't work on cursive in first grade, which they don't. That a parent might expose a first grader to cursive probably didn't occur to her and Olivia probably tried to fill in the blanks. The homework does drive me crazy, but in truth, if we just kept up with it, it would only take ten minutes a day of the written work. The daily reading is a different matter. It's just hard to make time every. single. night. The evening was remarkable for two reasons. Our schedule rarely works out so that we can spend productive time together aside from the daily requirement of eating and getting ready for tomorrow. They are either outside playing or dinner is late or they are cranky and unresponsive. It's hard when the majority of time you see your children is when they are at the end of their ropes. An evening with both time and good moods is remarkable. The second reason is because this is the exact situation that would normally make me twitchy. Four different people simultaneously making four different demands on me is a recipe for me to blow my top and tell someone to go away. But not only did I not do that, I didn't even feel like getting upset. Feeling competent on the homefront is a rarity for me therefore glorious.